The tiny Vodafone v1520 WM6 phone is a feature packed Windows mobile handset that hit the FFC a few months ago, cool sleek looking small phone that will go down well. Vodafone only list a very few features on their site such as a large 3.5 inch touch-screen, 2 megapixel camera, microSD slot, Bluetooth, integrated receiver, WiFi, and designed for line of business applications and navigation. However, the most outstanding feature is probably the 12 hours of talk-time with a 600 hours standby time. The v1520 WM6 weighs 188g, measures 121 x 170 x 16.5mm, has email capacity, and built in modem. As yet there isn’t a given drop date for this, and no price tag either, but we’ll keep our ears and eyes open and as soon as we know we’ll keep you informed. 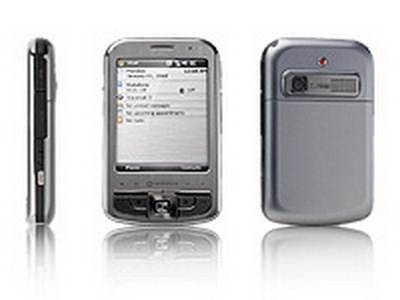 Next article Next post: BT Verve 500 DECT Triple phone with Answer Machine.